Embroidery is one of the most prestigious and beautiful arts in China. From its earliest development around 800BC, embroidery evolved rapidly over the next few hundred years and it was recognised as a prestige art, produced for the court and imperial family as well as being associated with religious ceremony and worship. Suzhou, a city with a long literary and artistic history, produced many scholars and artists and this environment nurtured the artistic style of its embroidery. 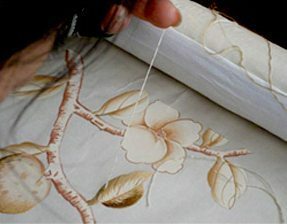 Suzhou’s hand-embroidery is renowned across the globe for its rich designs, its many stitches and its elegant technique. Embroidery started when people began to wear clothing of flax silk and fur, and images of nature were tattooed on. Designs of sun, moon, stars and pheasants were painted and embroidered on the ceremonial robes of rulers. The earliest embroidered objects excavated in the Shaanxi province date from the early Western Zhou dynasty (eleventh century-771 BC) are figures of dragons, phoenixes, tigers, birds, flowers, leaves and geometric vines. By the Han dynasty (206 BC – 220 CE) the silk handicraft industry in China had reached a fairly high level and the development of silk fabrics led to improvements in clothing and embroidery. Emperors, high officials and merchants wore designs on clothing, often painted or embroidered in different colours. The Tang dynasty (618 – 907 CE) was one of the most prosperous stages in China’s history with a thriving economy and a rapidly developing culture. 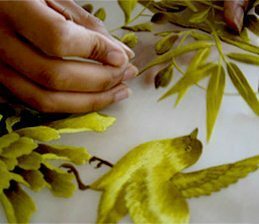 More progress in silk embroidery skills and techniques were made during this period with emperors giving precious, decorated items as gifts to their favoured subjects. Embroidered articles of this time include dresses, quilts, bed curtains and images of Bhudda. Significant progress in literature, art, science and technology was made during the Song dynasty (960 – 1279). Emperor Huizong championed the arts, promoted schools, founded an imperial arts academy and court workshops, carried out a series of enlightened policies to support painting and created a favourable atmosphere for artists. Themes during this period were wide ranging, painting skills were precise and penetrating and subjects varied from mountains, water, trees, flowers and plants to figures of gods and images of Bhuddas. At this time, embroiderers began to work together with artists and painters, copying painting and calligraphy onto silk fabrics with needle and thread, resulting in a refinement of their work. Vibrant and sophisticated embroidered articles were praised for their accurate and often lifelike depiction of subjects, the needlework fine and close without border stitches. During the Ming dynasty (1368 – 1644), the imperial court set up a government-run weaving and dyeing bureau in Suzhou. An embroidery workshop was established under this bureau whose speciality was the production of household goods such as robes, shoes and bed curtains. Many famous embroiderers mixed in Suzhou circles of that time and were as highly regarded as the city’s scholars and literati. By the mid 18th century, the Qing Imperial Weaving and dyeing offices in Suzhou, Hangzhou and Nanjing employed seven thousand workers, clarifying the enormous scale of production. Embroidery remained a prestige art throughout the imperial period in China and was considered a vital part of a daughter’s education, regardless if she was from a wealthy or common family. The quality of a girl’s embroidery was seen as a good index of her general ability and important in people’s estimation of her virtue, so much to the point that she was considered stupid if she didn’t have the skill. 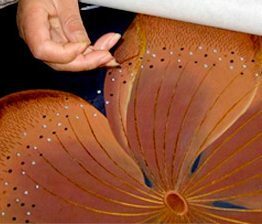 Embroidery artists Shen Shou and Yang Shouyu played an important role in promoting and developing Suzhou embroidery in modern times, creating new styles that gained accreditation at international fairs. They lay the foundations for the Suzhous Embroidery Research Institute and later the Suzhou Embroidery Technical School. The palette of Suzhou embroidery embraces an abundance and harmony of colours. In the 1960’s the Institute began to dye thread itself because the market supply of coloured thread lagged far behind the demand. On average, a set of threads in one colour is dyed in 30 to 36 increments, from light to dark and in more than ten steps from warm to cool shades. The breadth of colour produces a rich, varied and elegant effect.